I didn’t do my monthly ‘Life in Instagram‘ post in November as I didn’t have too much going on. But then in December I had so much going on, as I’m sure everyone did because it was Christmas! 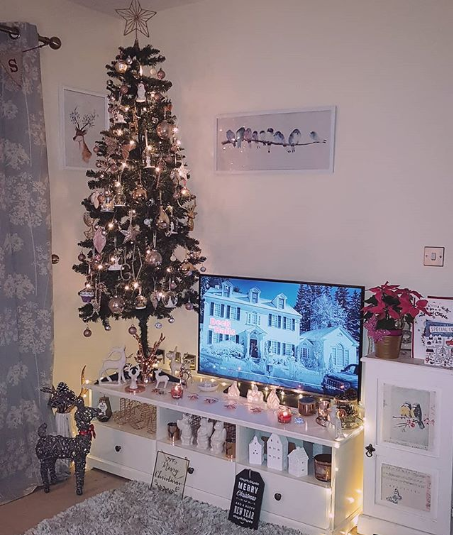 I know it was a couple of weeks ago now so everyone is so over it, but I just wanted to share some photos from last month which are all Christmas related. 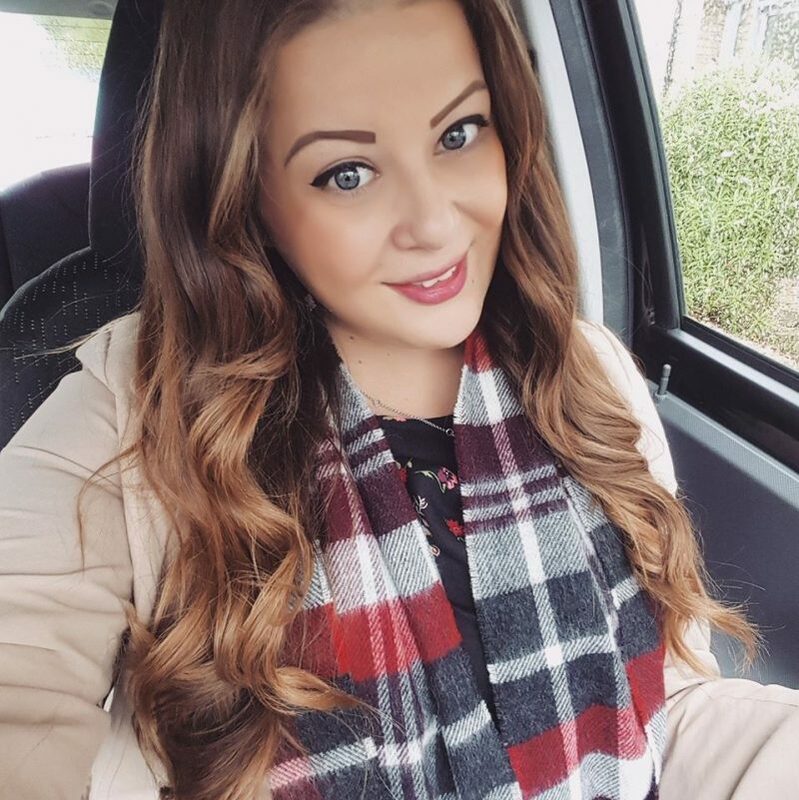 I like looking back on these types of posts and hopefully you guys enjoy being nosey and seeing what I got up to too! 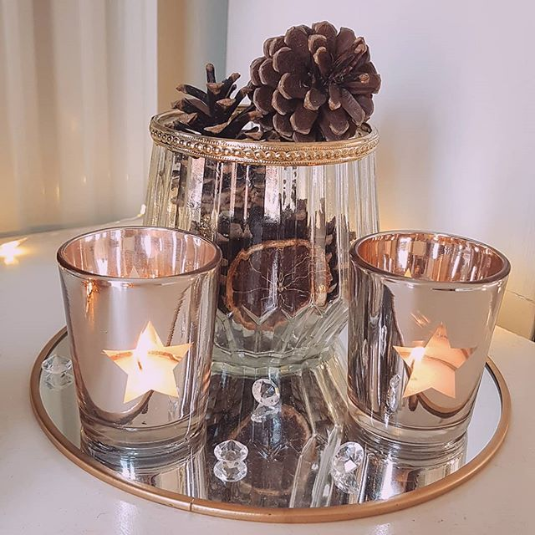 I always love seeing what lovely gifts people have received for Christmas, and although I have a small family and we don’t go crazy with presents, I got some gorgeous bits! 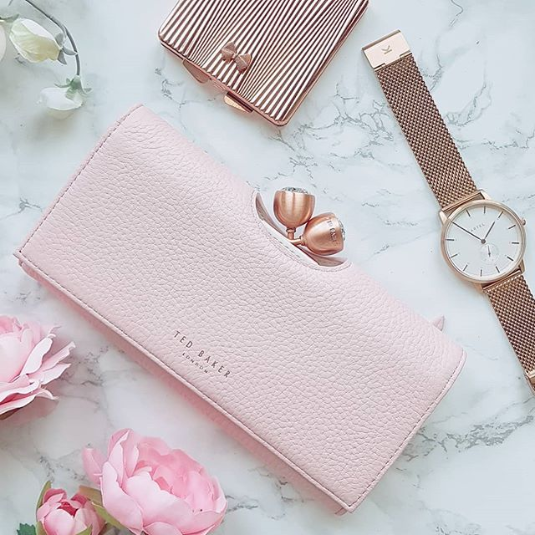 My favourite gift has to be this beautiful pink and rose gold Ted Baker purse that Gavin bought me, along with some curl and straight hair straighteners. 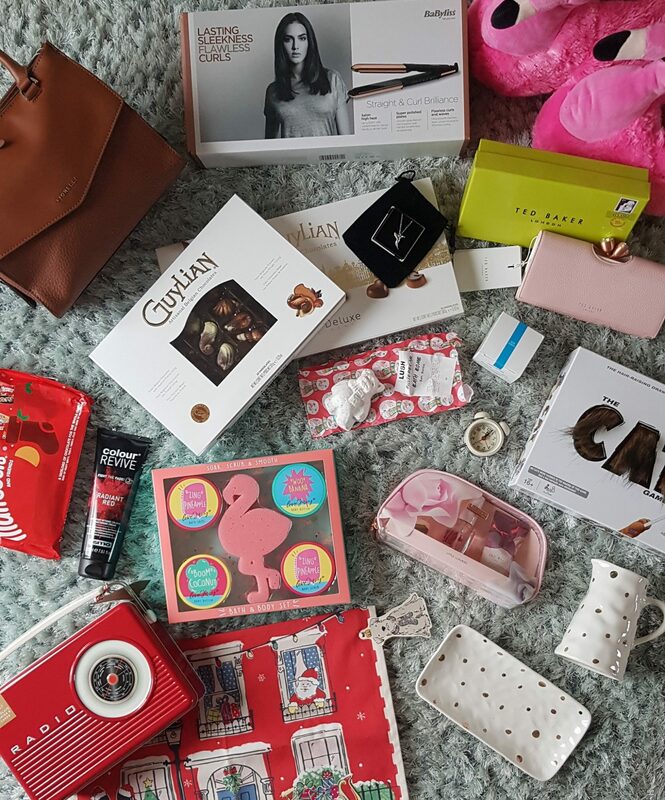 I also got lots of lovely little bits including huge pink fluffy flamingo slippers from my boss, a new handbag from my parents, a cosy new dressing gown and lots of choccys and nice smelly stuff. We also did a Secret Santa at work and I received a gorgeous Cath Kidston Christmas tea towel and Lush bath bomb! 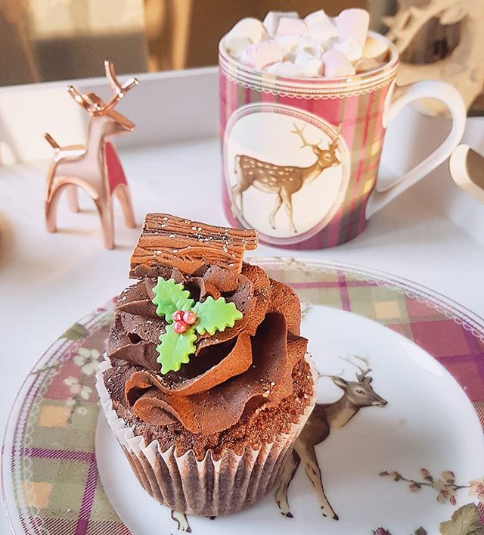 There’s a really cute little cake shop near me called Mrs Mac’s Sweet Treats and they sell the prettiest little cupcakes! Their whole store is pink and vintage style and I just love it so much! 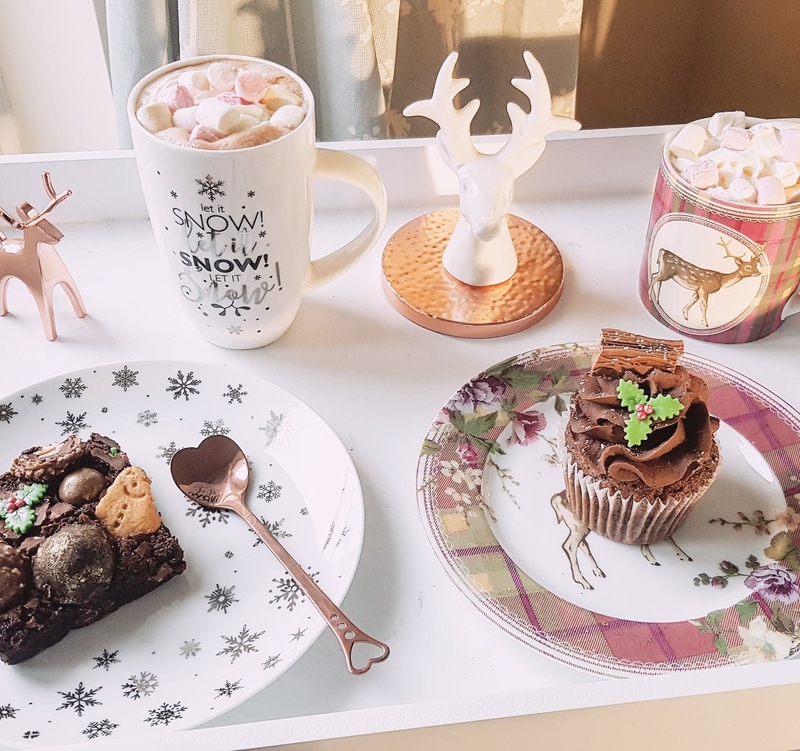 We visited just before Christmas and bought some festive treats. 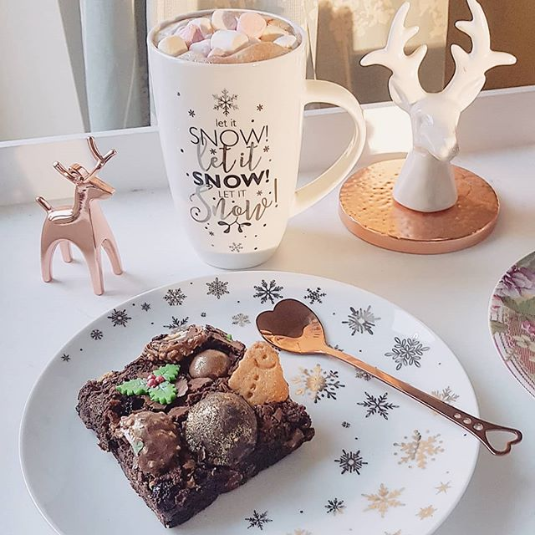 This chocolate brownie is fully loaded with lots of good stuff including Forrero Rocher, gingerbread, Malteasers and Toffifee! So yummy! 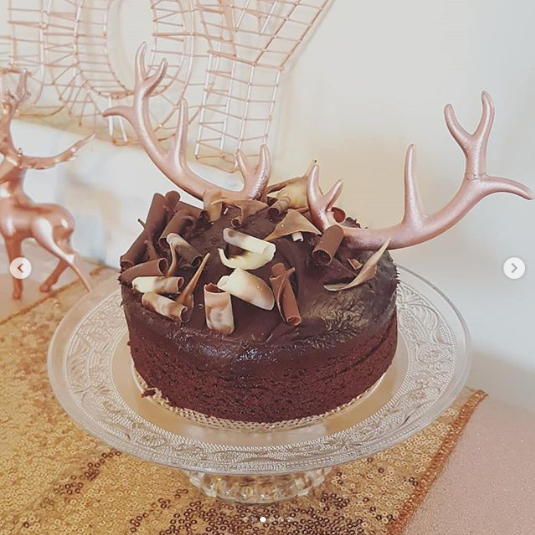 We also bought a Christmas yule log chocolate cupcake which was sooo good. 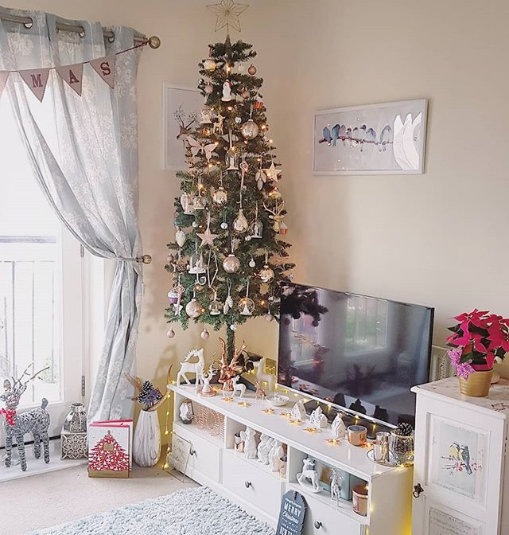 I totally changed the colour scheme for my Christmas tree, as previously it was Nordic and red themed, whereas this time I wanted something more ‘me’. I picked rose gold as the colour scheme this year, along with pink, gold, copper and white accents. I loved the new colour scheme so much better as I feel like it suited my home more. 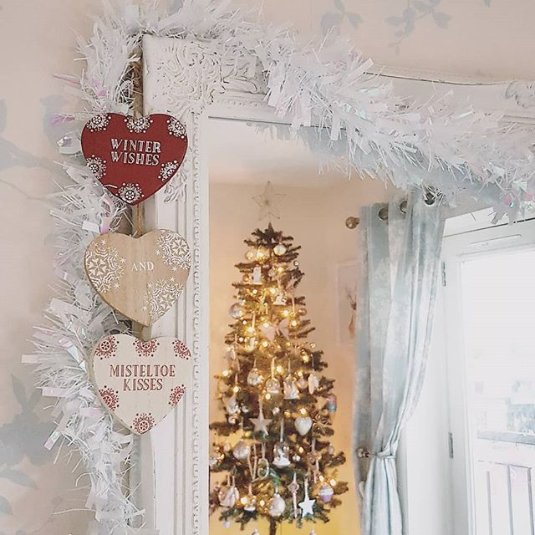 I also allowed Gavin to have a bit of tinsel… just a bit of white tinsel around the mirror! I hate the stuff. 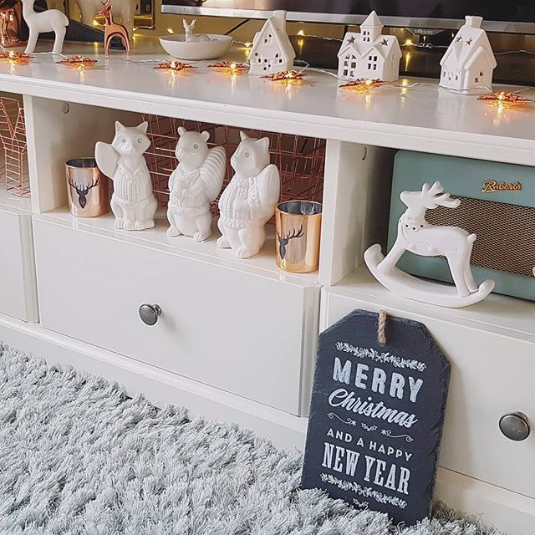 I love having lots of Christmassy ornaments around and this year they all matched! 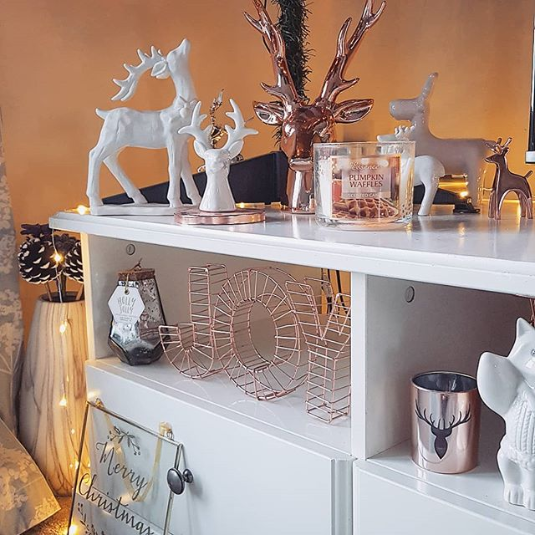 I collect little festive stags and reindeer so I had lots of those lined up on my TV unit, along with some copper tea light holders and accessories. So cute! 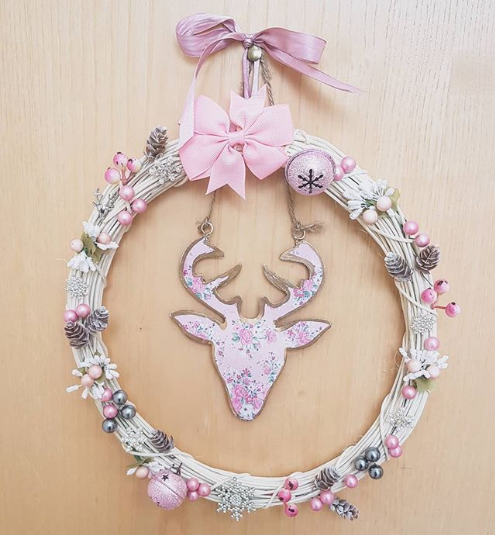 I tried making my own Christmas wreath with a Peggy Porschen pretty pink theme, but it looked a little bit lame as it seemed a bit bare so I didn’t put it on my front door in the end! But it did hang nicely on my balcony door so it did get some use in the end! 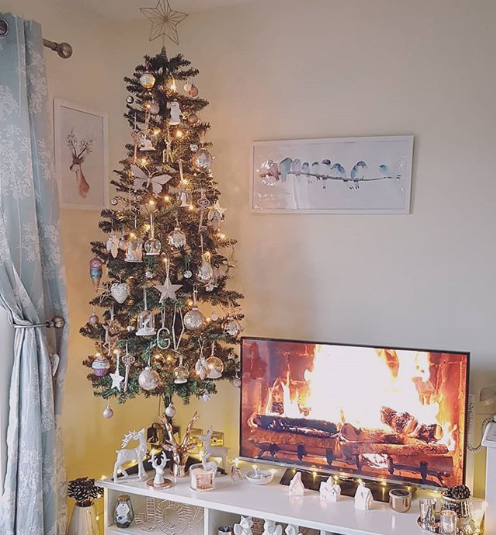 It’s kinda cute but just not very festive! My parents and I have a tradition where just before Christmas each year we visit a local market town called Olney which isn’t far from us. 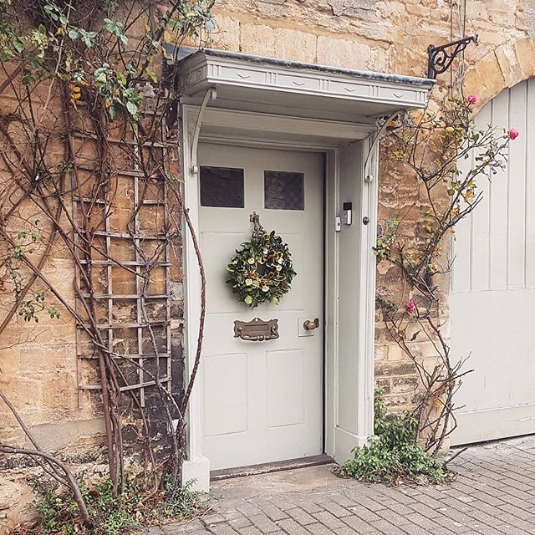 It’s a really cute little town that looks so gorgeous at Christmas as all the pretty old houses put fresh foliage wreaths on their door and there’s lovely decorations everywhere. 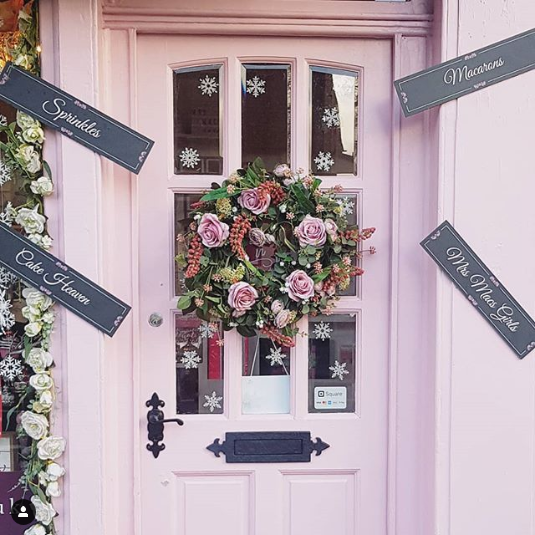 I always love taking photos of all the pretty doors! Then we stop for a little afternoon tea at a cute little cafe and I like strolling around the charity shops there too! I had my nails done in December with a slight Christmassy theme. 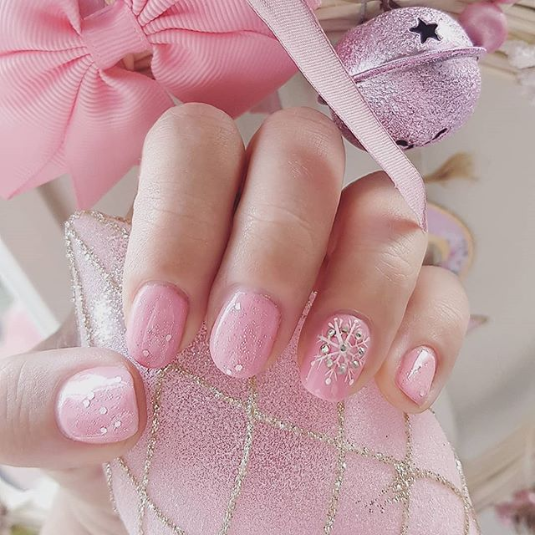 I didn’t want to go too OTT mad with garish Christmas nails, so I decided to get them done in a pretty pink with silver glitter sparkles and a snowflake painted on my ring finger with little diamantés. I loved them! I even had Christmas bedding! 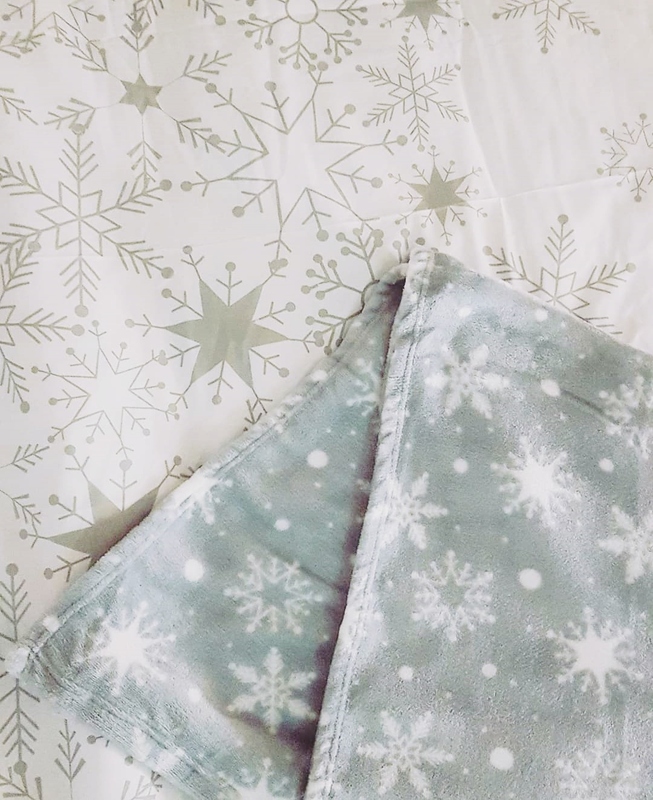 I actually have two lots of Christmas bedding, but this is my new one! 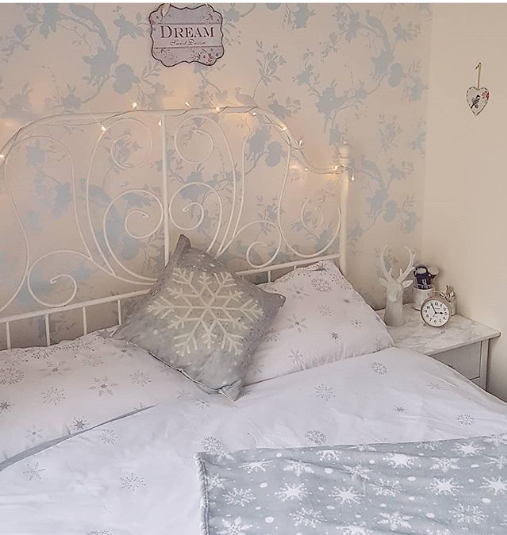 I bought this white duvet set with grey snowflakes on from Asda for only £14 (for king size) and the fleece throw was only £6. I like this set because again it’s not too OTT Christmassy! This year we had our work Christmas party at Whittlebury Hall Hotel and Spa in Towcester which was lovely. We each had our own rooms so that we could all stay for the night without the hassle of taxis etc. I wore this gorgeous Frock and Frill embellished dress and I love it so much. It was in House of Fraser for £135 when I spotted it and fell in love, but it was way out of my price range. But I managed to find the exact same dress in my size for only £15 on eBay! So I snapped it up and luckily it fits and absolutely loved wearing it. It’s now in the sale at House of Fraser for only £46. Just after Christmas I had a few of my friends over for one of my quarterly tea parties! 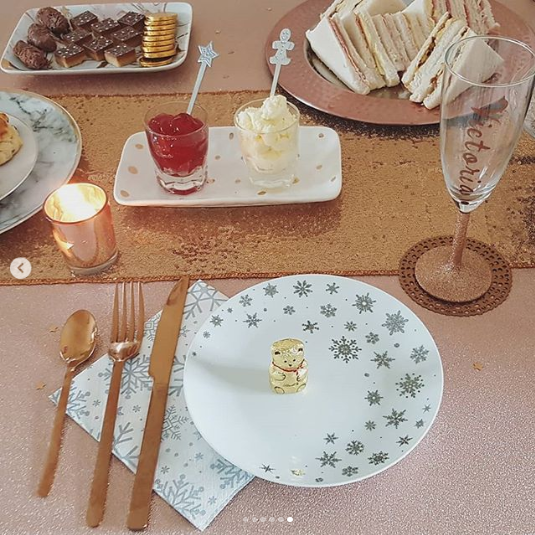 I decided that the theme would match my tree so it was a gold gold glittery theme. 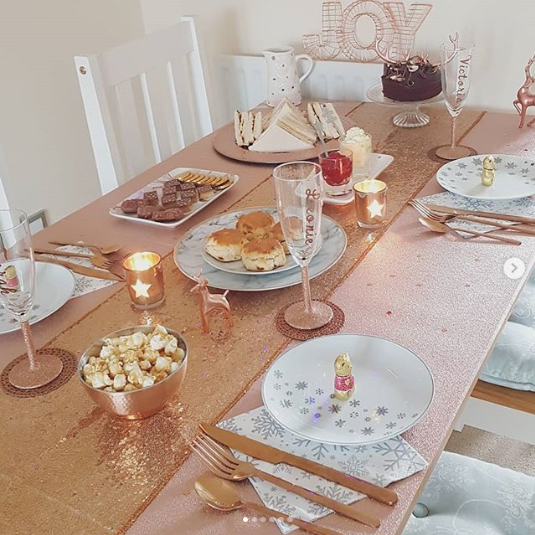 I used a rose gold glitter wallpaper sample from The Range to lay out on the table as a table cloth, and then bought a really cheap sequinned table runner off eBay. I also couldn’t resist buying a rose gold cutlery set from Asda (£15!) and some festive snowflake napkins. 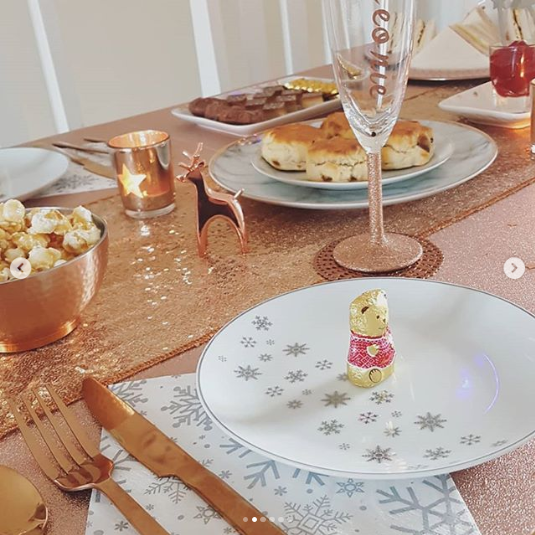 The snowflake side plates are from Home Bargains and Debenhams, the copper coasters from Laura Ashley, and the marble plates from from Home Sense/Dunelm/New Look. 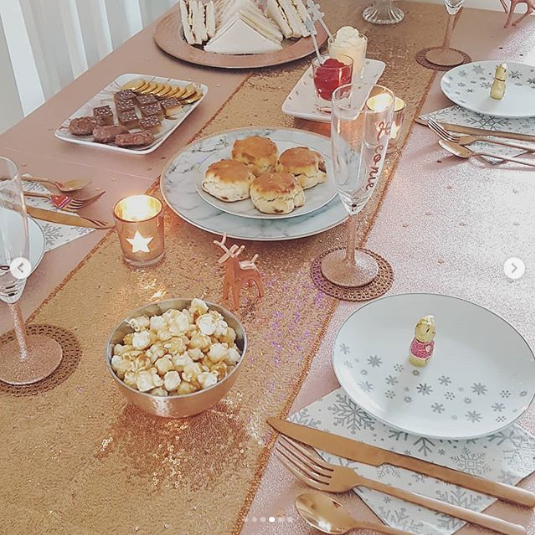 I also scattered some rose gold stars on the table and decorated with rose gold tea light holders from Dobbies. I also bought some personalised champagne flutes from a local lady on Facebook. They were only £1.50 each! 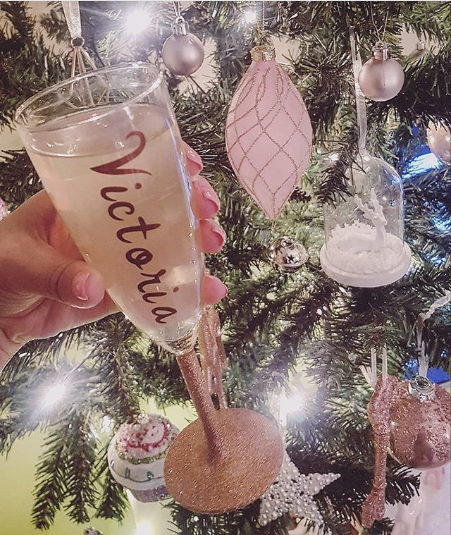 She uses glue and glitter to cover the stem of the glass and then adds a metallic vinyl with each name on. Clever! 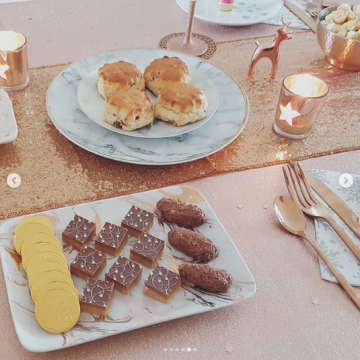 We ate traditional afternoon tea foods – sandwiches, scones with cream and jam, and a selection of cakes and chocolates. Yummy!